For weeks, the Texan has tried to balance three objectives: lowering the corporate tax rates, finding ways to offset that lost revenue with other changes to the tax code, and holding together his caucus along the way. 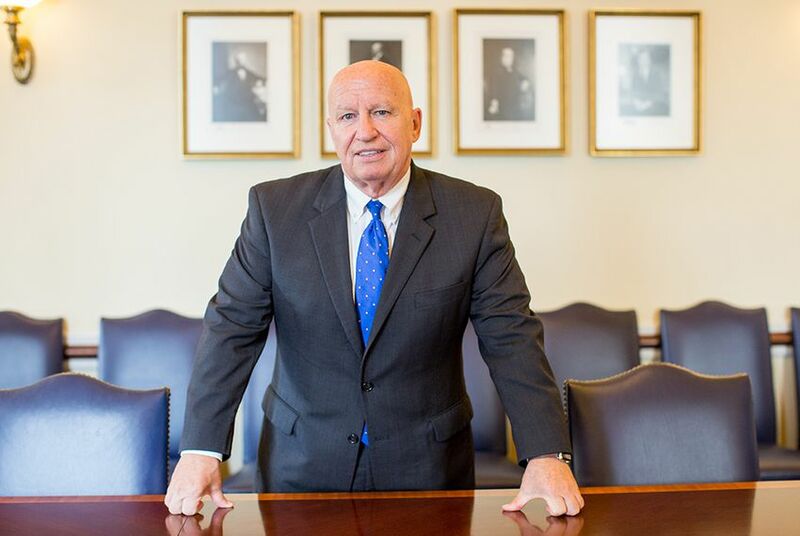 WASHINGTON — It's not hard to find U.S. Rep. Kevin Brady around the U.S. Capitol these days. Tasked with moving a major tax overhaul through the Congress, he's the most popular target of reporters. Everywhere he goes, a scrum of a dozen and a half journalists chase him around and pepper him with questions. They patiently wait as he does television hits in Statuary Hall under the gaze of a marble version of Sam Houston. They're there, staking out his office at night. They ask him about deductions and timetables and tax credits and corporate rate phase-ins. On Tuesday evening, the Woodlands Republican had his fill and politely excused himself into the Ways and Means Committee chairman's office. But there was one last question: "How's the pressure of it?" He stopped, turned around, faced the reporters and smiled. "Look, I worked hard for this job," he said. "And I have 23 of the best committee members in the world. This is why we came here." For weeks, he's tried to balance three objectives: lowering the corporate tax rates, finding ways to offset that lost revenue with other changes to the tax code and holding together his caucus along the way. On Thursday, Brady and his colleagues rolled out their plan to colleagues and reporters. U.S. Rep. Tom Cole, an Oklahoma Republican, emerged from the presentation praising what he saw. “It’s probably the most unified conference I’ve seen in a long time,” he said. Later, Brady unveiled the details to the public. Among the highlights of the proposal: Cutting the corporate tax rate to 20 percent, lowering the number of income tax brackets from seven to four, increasing the child tax credit from $1,000 to $1,600 and repealing the estate tax in six years. These changes are expected to increase the federal debt, which could endanger support for the legislation among GOP deficit hawks. Brady's task going forward is to convince GOP lawmakers to set aside fiscal and geographic concerns. This is unquestionably the most stressful and consequential week of his career — so far. The stakes could not be higher. Changing the tax code is not just the professional dream of Brady but also of his close ally, U.S. House Speaker Paul Ryan. But so much more is riding on this plan than mere policy. The first year of the Trump presidency has not produced a major legislative achievement. An attempt at a health care overhaul failed in the U.S. Senate. Trump's approval ratings and those of House Republicans continue to plummet. Current Republican members of Congress, Brady included, are nearly all acolytes of Ronald Reagan and his free market ideology. Passing a major tax overhaul would be a generational capstone. Failure could be the tipping point that some worry would turn the Republican midterm fortunes into a disaster. Possible scenarios are already being painted: More House Republicans will retire, turning once safe seats into opportunities for Democratic challengers. Donors nationally and back home in Texas are making their threats known to any Republican politician who picks up the phone: You failed at health care. You had better not fail at taxes. The fear among many Republicans is that coming up short now could be what sends the gavel back to U.S. House Minority Leader Nancy Pelosi next year. Brady delayed the rollout by a day, an ominous sign to many. Some House Republicans are grim, while other members are downright sunny. "Everybody's going to get their two cents' worth in, literally, and I'm confident that it will pass," said U.S. Rep. John Culberson, R-Houston. "I am so proud of this man," Ryan added of Brady, calling him "the leader of this moment." But even as Brady squares the responsibility on his shoulders, some on the Hill say he's operating with obstacles that are not normal in major tax reform efforts. During the 1986 tax code overhaul, President Reagan worked with the House Democratic speaker, Tip O'Neill. That gave the GOP caucus room to lose votes on their own side. Democrats were not included in this push. The policies unveiled are anathema to their worldview, and they are more than happy to sit on the sidelines. U.S.Rep. Lloyd Doggett of Austin is the lone Texas Democrat serving on the tax-writing committee. As expected, he blasted the plan. "The smiles and middle-class hype cover up a giant giveaway to special interests," he said. "Since most of the tax benefits go to giant corporations, this bill is a testament to the power of limousine lobbyists." Culberson, like other members interviewed on the Hill, praise Brady as an inclusive force. "He's a natural because he's so thoughtful, so considerate, he's got a heart of gold and a deep, keen understanding of the economy and how vital it is that the Congress gets tax collectors out of our pockets off our backs and out of our way." But some wonder if that's enough. Reagan's tax reform strategy had one of the most adept dealmakers ever, then-U.S. Treasury Secretary James Baker III, pushing policy from the White House. There's a sense around the Hill these days that Brady and his allies are operating in a vacuum without presidential guidance, and this job might just be too big for a single chairman. "It will happen," Culberson said. "Failure is not an option." Brady was up late Wednesday night, tweeting about the Astros' World Series victory. It's been a heck of a week for the chairman. Then again, it's been a heck of a year. He and his colleagues tried and failed to overhaul President Obama's 2010 health care law. He spent part of the summer at the bedside of his roommate, U.S. House Majority Whip Steve Scalise, who was wounded in the June baseball practice shooting. Brady only narrowly missed the shooting himself when he left early to tend to his chairmanship duties. Hurricane Harvey brought Brady's district to its knees. Then last night, the Astros gave the region a much-needed boost. Now, it's Brady's turn to deliver.